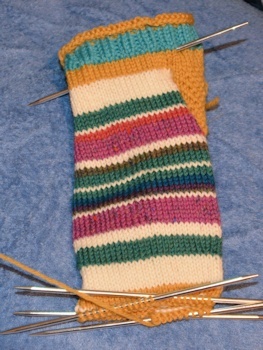 I'm knitting another pair of shorty socks, this time using more of my mother's stash of Bernat's "Sesame" yarn (they don't make it anymore: 100% wool, lovely feel, came in "pull skeins" neatly wrapped into narrow plastic sacks with a little device that let you pull the yarn out through the hole with no tangling, permanently mothproofed. Some of this yarn was leftover from one of my college cardigans (old-gold), some was leftover from a pair of sock-slippers (Dapple Bronze), and one small ball was from something else (my mother's own projects--sort of a dark salmon color.) These yarns were bought in the 1960s. I combined these three yarns with two Cascade 220 superwash yarns left over from making socks ("Lake Chelan," a green-blue and a purple whose name I've lost), one Cascade 220 yarn (white) bought for striping, one Ella rae Classic superwash yarn (turquoise) and one Ella rae classic yarn left over from making socks (dark teal blue) and one Plymouth Yarns "Galway Nep" (dark rose with yellow, blue, orange-red, and green flecks.) To me, indoors while knitting, the "Lake Chelan" was definitely green; the socks I'd made from it had become greener (a soft bluish-grayish green) with the years. 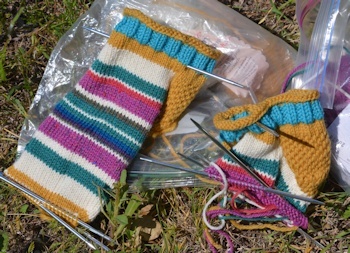 So, with one on the toe decreases and one past the first two colored stripes, I took them outside to photograph and show off. So I brought them back inside and tried again. This is on the chair in my study, with a combination of strong LED lights in two colors, some green-cast shade daylight coming in the top of the window and the camera's own flash. Worse egg-yolk yellow "old gold yarn" but the turquoise better & salmon less garish. The Lake Chelan shows a little why I think of it as green. The dark teal looks like a cobalt blue; the purple stripe below it and the dappled bronze below the purple have melted together in color. So I took them to the kitchen and tried again. There I had the top light on (LED bulbs inside a white ceiling fixture) the hood light over the stove, a slight influence of daylight from the kitchen window, and the camera flash. And when that didn't work much better, fiddled with the color balance and histogram adjustment until I got something remotely right for the old gold color (it's actually a tad brighter.) But now the turquoise looks more blue and attempts to lighten it overall didn't improve anything much except that the white looked more white. I have had trouble photographing yarn before, especially greens. Especially my favorite emerald green, a lovely saturated cool green that comes out looking anemic and bluer than I see it. This turquoise, which is a good medium turquoise, a color that everyone calls turquoise, photographs bluer than it is, often looking like a robin's egg blue or light sky blue. But my jeans don't. That blue towel in the second picture didn't. I think it must be an effect of the dye used on the wool. I swear that these socks look better in real life (in terms of colors) than they do in the pictures, any of the pictures, but they'd be better if the Lake Chelan were greener. In my opinion. 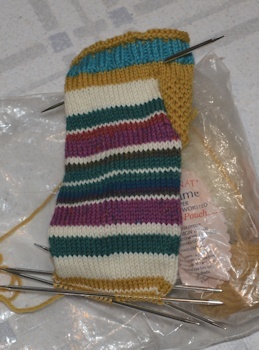 But now I'm not nearly as happy with the socks as I was. Maybe I should only wear tham at night or indoors. These are amazing. I love the colours, but were especially impacting before I inspected the colours, separately. Maybe it's a matter of allowing the brain to continue tricking itself, by not too much observation. Actually putting these ones away for a while, and bringing them out later, when your eyes can see them fresh, might do the trick. Colors are weird. I'll repeat my advice to get at least a color target for your photography (if not a full-on monitor calibration kit), but I also found it mind-blowing the last few times I tried to read up on color. I think it must be an effect of the dye used on the wool. I think this is metamerism. As you intuited, it seems likely that the different dies (towel, jeans, yarn) might appear to be roughly the same color to your eyes (which have three sensitivity peaks, but see below); the [filter in front of the] sensor in the camera probably does not match your eyes perfectly, nor will the CRT / LCD you're using to render it. On top of that, the camera and/or the display software might take liberties with the white balance, further muddying the waters. Note that almost all light sources have their own spectra; fluorescent lights used to be really bad, although the more recent "full-spectrum" lamps are better. LEDs are still kinda bad, but they're also getting better. Those both rely on phosphors to convert narrow-band light into more wavelengths -- but they're still not perfect. Phosphors based on quantum dots might get better. Sunlight is generally nice, but its light has absorption gaps due to passing through the atmosphere. This is often used to good effect, hence the "golden hour" for taking photos right at sunset. I know I was taught color by my mother, who used to take her racks of sewing thread (a rack of reds, dark-to-light, warm-to-cold--a rack of blues--a rack of greens) and dump them out and have me sort them back into order. Then hand me other spools--what does this match? What does that match?) and also point out to me variations in color, the effect of shadows, warm and cool shadows, and the like. I remember her showing me why tree trunks aren't brown (as my teacher had told us) and the tree leaves just green. She showed me how the color of light affects the colors we see, and so on. She painted, she sewed, she did photography...and we did not like the same colors, or use the same colors, but we talked colors, and I developed the eye--that comes from practice and mindful noticing--to be able to have fabric at home and match thread for it at the store, or see a flower in a field, sketch it in pencil and then color it at home. Colors affect me--well, they do everyone, but there are combinations that thrill me and others that sicken me. There was an illustration in a book--Wesley Dennis's painting, in Henry's _King of the Wind_ of the horse being shown to the queen and draped in red and royal purple. The red and purple together--*that* red and *that* purple--lifted me up and I looked at that page over and over and over. I had a little scrap of velvet almost that purple and I used to lay a red ribbon on it. There's a quality of light that comes only with the sun slanting under a stormcloud--it turns colors brilliant and shimmering even without rain...things glow. I know I can't distinguish colours as well as other people. My daughter can look at two colours that are off by a shade and will see the difference where I won't. That's fine. I can still appreciate the richness of colours when I look at something. You always pick such beautiful colours that I can't imagine you putting together colours that don't go well together. I think right now you became too critical of the socks when you were trying to colour balance the pictures and need a break from them to let yourself see them as they are. A friend of mine has synesthesia, which gives her the ability to taste colors. Whenever I have doubts about a color choice when making a quilt, I ask her to give me her opinion. If they make her drool, they work. :) Your comment about some colors being sickening made me think of her, because she will sometimes react in a similar way.